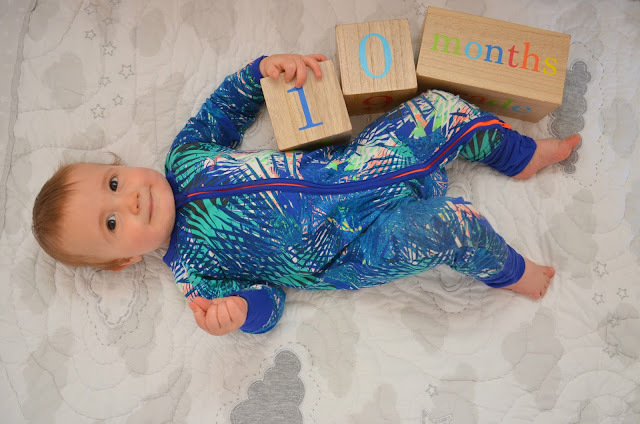 He's 10 months old and well and truly on the move! And that means it's a whole new ball game. We suddenly seem to have this extra presence in our house and have to be aware of where he is and what he's doing all the time. No more plonking him down on the mat with a basket of toys to occupy him. Cupboards, drawers and doors are now hazards we have to be even more careful of Miss M's teeny tiny bits and pieces. 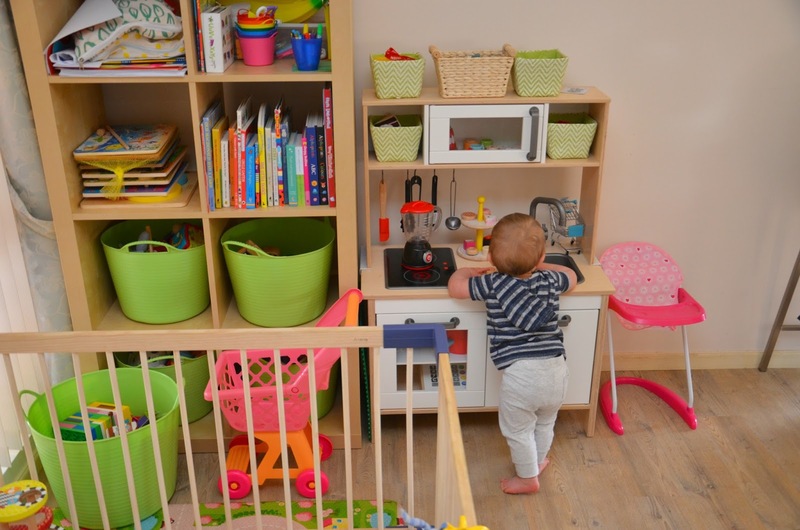 We flipped the IKEA shelves up so that some of Miss M's things could be kept up high out of reach, and it created a bit more room for her play kitchen. (Which the little man is now very interested in as you can see). ...and wants to get out. 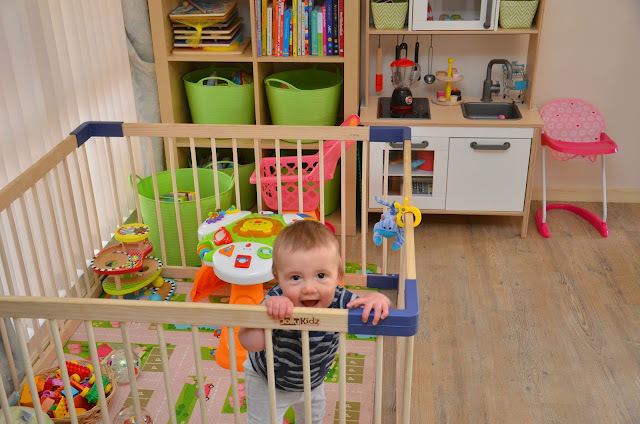 One of my Instagram friends Amanda from MW_Adventures had the brilliant idea of setting up a toddler area in the play pen - the idea being that it keeps their creations safe from babies destroying them. We have yet to try this but it's on the to do list! But really though, the play pen has become a toy storage area and just another thing taking up room in our house. 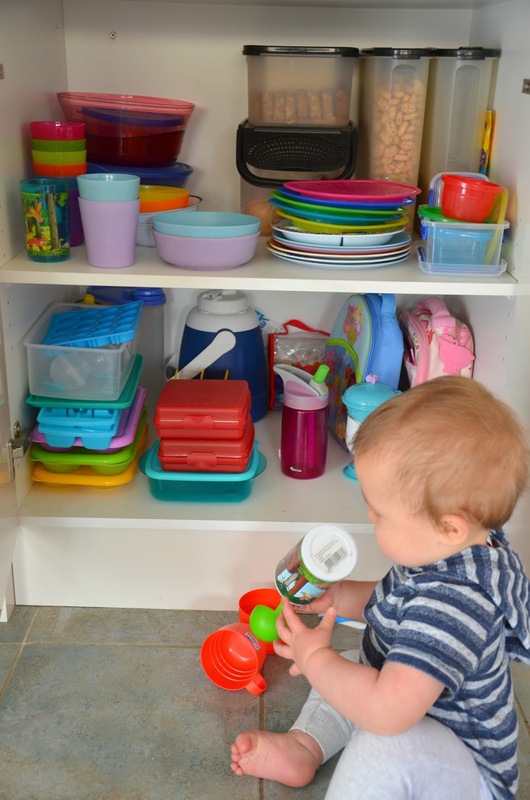 ...and the Tupperware cupboard is now another play area. 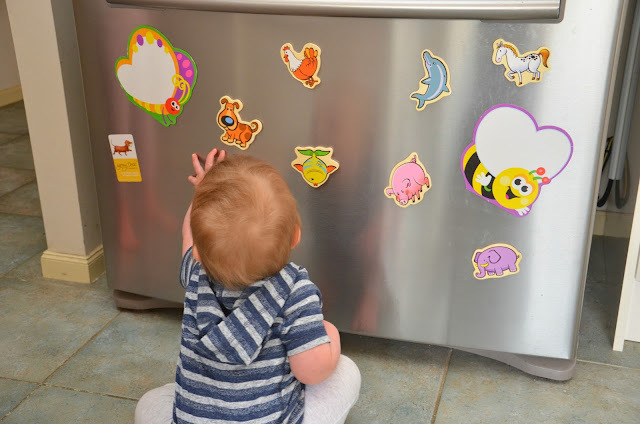 Is it weird that I just shared a photo of one of my kitchen cupboards on my blog? Feels a bit weird. We've had to update our baby proofing to make sure little fingers aren't going to get hurt in drawers and cupboards, and I'm always making sure that the doors down the hallway are all shut. And of course his big sisters room is very interesting to him, because that seems to be where all the action is! (Once again, making sure teeny tiny Splashlings, marbles, gems, kinder surprise toys, dolls house choking hazards are put away!). How do you go about baby proofing? Baby gates, play pens, cupboard locks or do you just teach them "no"? Your Tupperware cupboard is so orderly. Please tell me you tidied it for the photo. Haha! Yes I actually did LOL! Looks lovely! We did really REALLY intense baby-proofing for our second baby after her second hospital trip in a week for swallowing things that were serious choking hazards when she was 10 months old (One time via ambulance called by the doctor and the second one required a visit to surgery) so we basically removed EVERYTHING from the living room and safety gated it in so she couldn't leave the room. We even removed the dining table and unnecessary furniture so there was no where little bits and pieces could be kicked out of sight. And no shelves or toy boxes, because what if there's a broken toy at the bottom?!?! The toys were kept upstairs and we brought a few things out at a time. Big kid was only allowed to play with lego in his bedroom with the door shut. And every time people came over they were like "wow, it's so clean!"... yeah... because the small one has a death wish. lol.